The ninja strikes again with a nice outlet at Seah Street. Opened on 1 October 2016, Ninja Cut is the sister outlet of the popular Ninja Bowl. The difference here is that the menu features more premium ingredients such as roast ribeye crackling pork belly, cod etc. 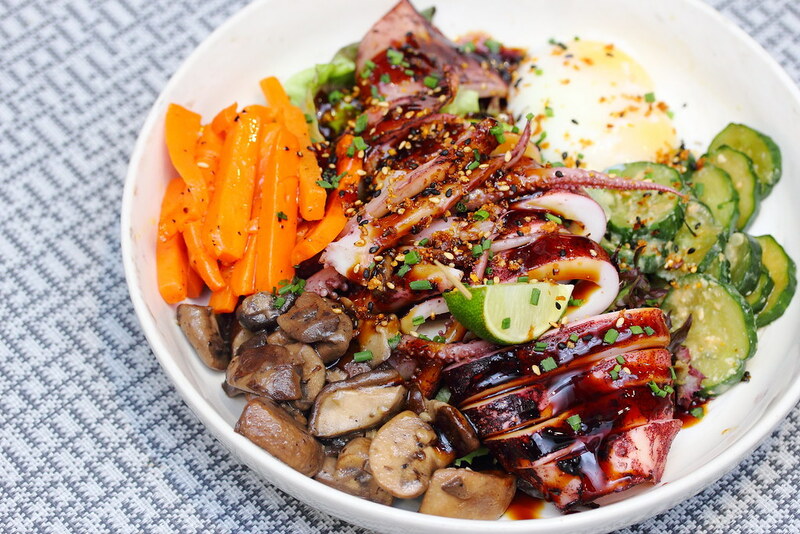 Similar to the concept of Ninja Bowl, diners have the option to add a base of choice to the bowl such as soba noodles, quinoa, ninja rice and garden greens at an additional cost of $2-$3. 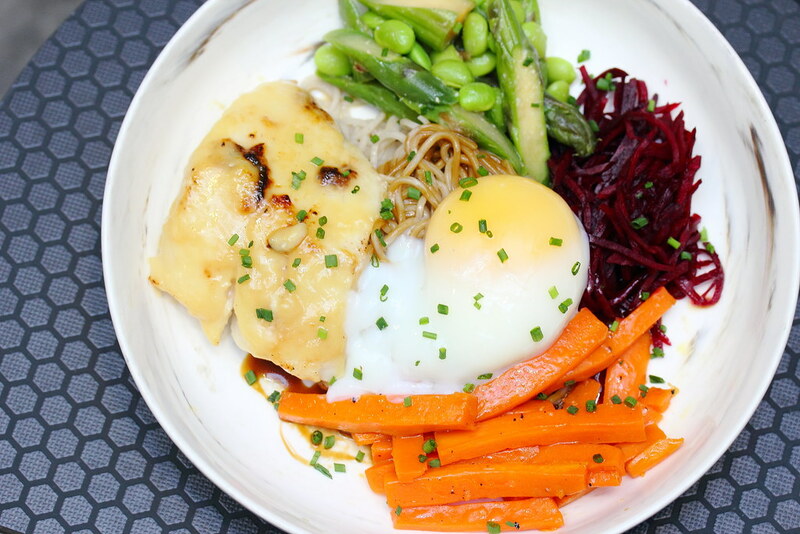 Oh My Cod ($18) comes with a baked fillet of miso cod, pickled beets, honey-glazed carrots, asparagus, edamame and an onsen egg. For the base we added Soba ($2) to complete the meal. A highlight of the bowl is the umami-filled saikyo shiomiso from Kyoto, giving the buttery cod fish an additional layer of sweetest. Gimme Chimi Chicken ($14) consists of cajun-spiced chicken breast. chimichurri sauce, sauteed brussel sprouts, cherry tomatoes, grilled corn furikake, mixed nuts and an onsen egg. We added quinoa ($3) for the base. 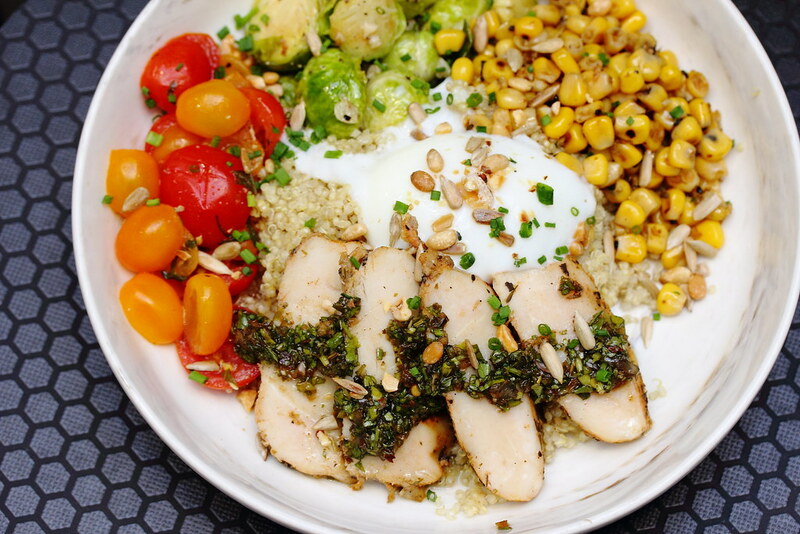 The highlight for this bowl has to be the chimichurri sauce that elevated the whole enjoyment of the tender and juicy sous-vide chicken breast. The Squid Fix ($18) is my favourite bowl at Ninja Cut. It comes with a whole Japanese squid that is first brushed with a sweet secret recipe sauce blend before it is gently grilled. The bouncy tender rings of squid is accompanied by sauteed mushrooms, miso cucumbers, honey-glazed carrots, furikake and onsen egg. We added garden greens ($2) for the bowl. I probably would add the ninja rice in my next visit for a more substantial meal. What's Your Beef ($18) features a whole 150g of succulent roast beef ribeye cooked to medium rare. 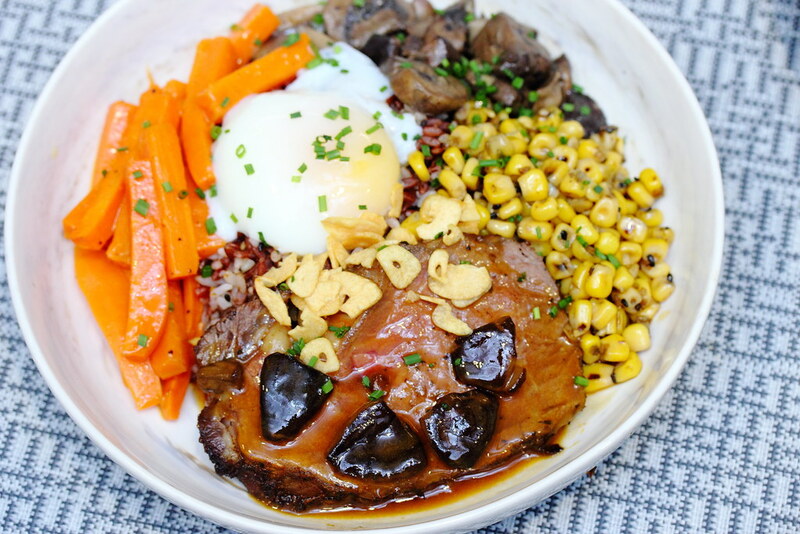 It comes with grilled corn furikake, sauteed mushroom, onsen egg, honey-glazed carrots and garlic chips. Be early if you want to have this as it is limited to only 30 servings per day. Moving to the all-day brunch selection, the Polenta Mash ($18) is owner Darren's favourite. 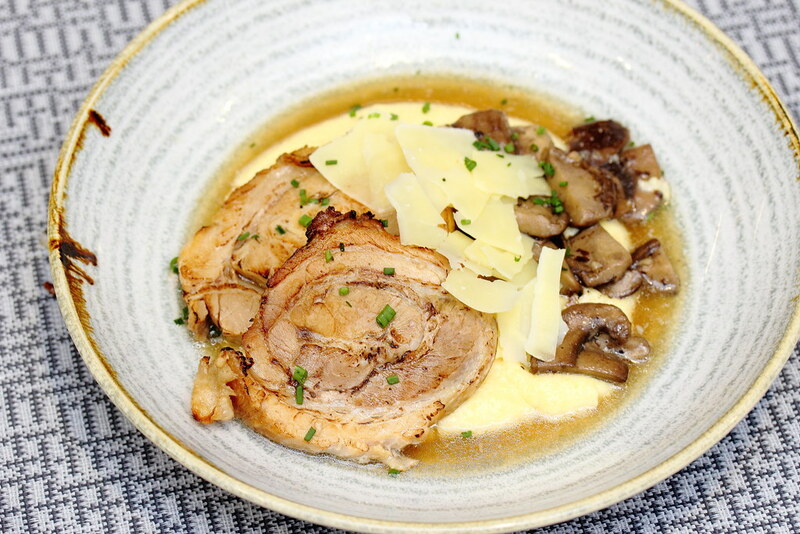 The rendition of the southern creole breakfast of pork and grits rendition at Ninja Cut comes with warm truffle polenta mash, sauteed mushrooms, shaved Parmesan cheese and aburi pork slices. A hearty and comforting dish that can be enjoyed anytime of the day. A crowd favourite has to be the Cheeky Cheese ($18). 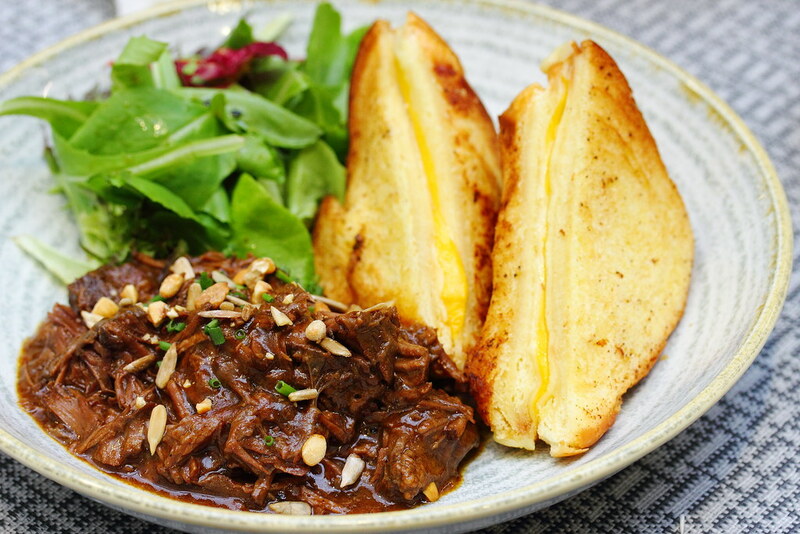 Upping a notch at Ninja Cut is the 24 hour braised Japanese curry beef cheek, that is seasoned with red wine and braised for a full day in the curry for a full bodied flavour. The other star item on the plate is the grilled cheese brioche sandwich that is so good on its own. Mop the gravy with the sandwich to soak up that beautiful flavour. The Marvellous Matcha ($16) is like the upgraded version of the matcha lava cake I first had at Babette, one of the restaurants under the group. 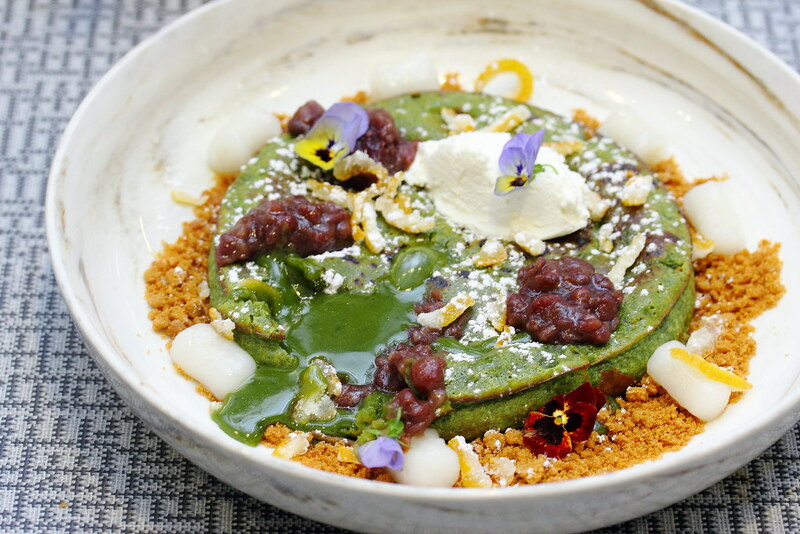 The matcha 'hotcake' is filled with a green tea fondant and topped with a dollop of ricotta cheese and adorned with pretty edible flowers, speculoos crumble, yuzu peel, azuki beans and homemade dango. A 15-20 minutes of waiting time is required for this dish. 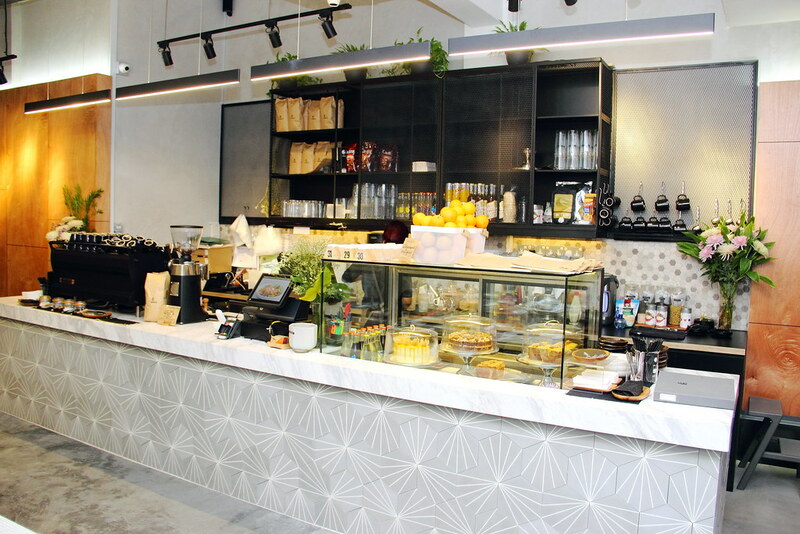 Ninja Cut is a fuss-free convivial dining concept that offers a collection of ten main dishes and a variety of brunch items. The meals are prepped a la minute to serve and all prices are nett cost. By the way it also serves a good coffee blend that is specially roasted and curated by Tiong Hoe Specialty Coffee. Noted: This is an invited tasting.